Pictured Aidan O’Neill and members of the Burren Community Forum presenting a cheque for £405.00 to Thelma Thompson, Fundraising Coordinator, PIPS Hope and Support. 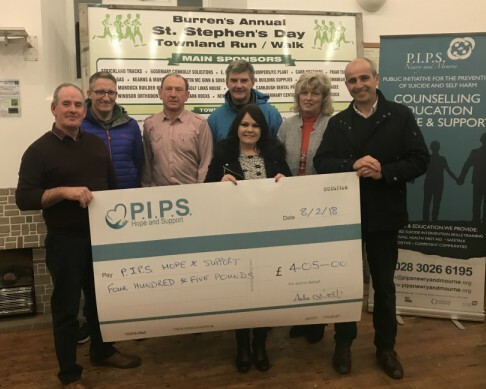 The Board, Staff and Volunteers would like to take this opportunity to thank the Burren Community Forum and their supporters, for choosing to support PIPS Hope and Support. All funds donated will be used to help reduce the stigma of suicide and increase awareness and training in our area.